The Foyle International Maritime Festival 2014 will be held from 20th of June – 29th of June. The Festival will see the return of the Clipper Roun the World Yacht Race to the City due the huge success when it visited in 2012. There will be a Derry yacht competing in the clipper race which you can be part of by applying at www.derrycity.gov.uk/clipper. The Festival will also return to the City in 2016. As part of the celebrations the Grammy Award winning Beach Boys will be performing on the 26th as part of their Good Vibrations Tour which promises to be a fantastic start to a summer of celebrations. Why not make your visit to the Foyle International Maritime Festival more memorable by booking to stay at Derry Self Catering Apartments. The Grammy Award Winning ‘Beach Boys’ will be performing in the city on Thursday the 26th of June 2014 at Ebrington Square as part of the Foyle International Maritime Festival. The Festival will be the first major concert of the year for the city’s music celebrations of 2014. The Beach Boys are arriving in Derry as Part of their mini tour of Europe which is part of their main ‘Good Vibrations’ tour. The arrival of The Beach Boys will be sure to be an amazing and memorable start to a summer which promises to be full of celebrations. Tickets for ‘The Beach Boys’ are priced at £20 plus booking fee and are available at The Millenium Forum or online at www.milleniumforum.co.uk. Ticket are subject to availability. For accommodation for The Beach Boys, Derry Self-Catering Apartments have a number of available houses. The City of Derry Drama Festival 2014, which is the 34th annual festival, will be held for 9 nights from the 7th-15th of March at The Waterside Theatre. The City of Derry Drama Festival celebrates the best of amateur talent in Ireland. The Festival has grown in recent years from the first festival which was held in the Great Hall in Magee in 1981. Since the inaugural festival in 1981 which was for people in the local community the festival now attract top acts from all over Ireland. Groups who achieve three first place awards throughout different drama festivals including the City of Derry Drama Festival will qualify for the All-Ireland finals which will be held in Town Hall, Claremorris, Co. Mayo from 4th-12th of April 2014. If you are competing in the City of Derry Festival or are just travelling as a spectator why not book into one of our luxury self catering apartments. The Walled City Marathon is an annual event which takes place in Derry and sees athletes arrive in the city from all over the world. The Marathon is set out over 26.2 miles which takes in some stunning view which Derry has to offer from the banks of the Foyle to the Guildhall Square. There will be a number of other events for people to take part in such as the 10k and 10 mile challenges aswell as a 1 mile mini marathon for local children. 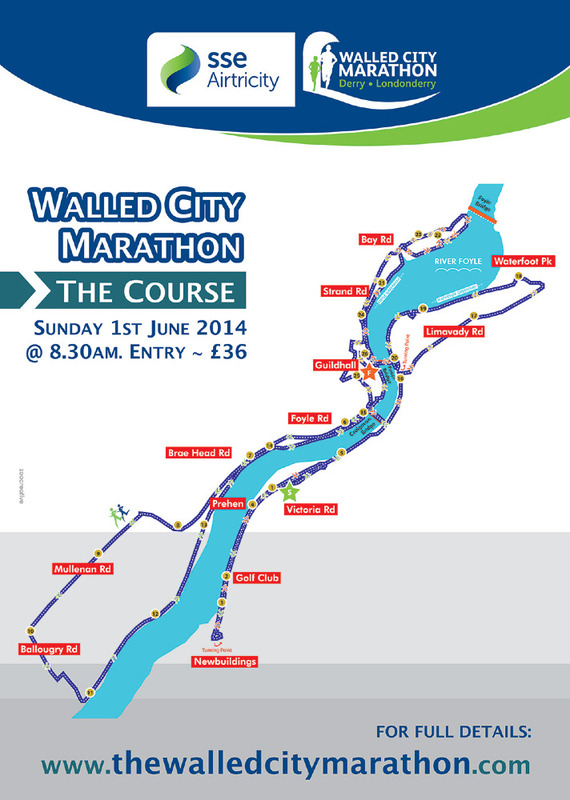 The Walled City Marathon 2014 will take place on Sunday 1st of June at 8.30am from The Everglades Hotel. All entries for the marathon should be made at the website. The cost for entering is £36 plus a £2.20 transaction fee. 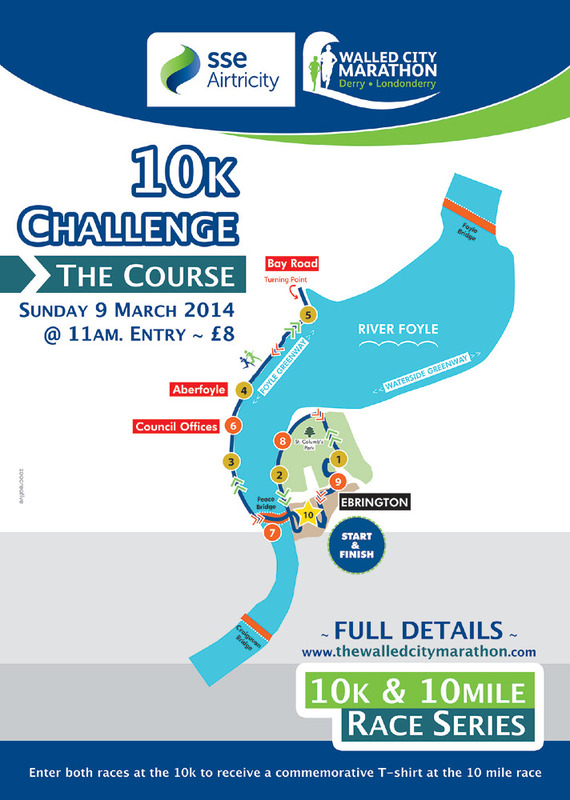 The 10k challenge will take place on Sunday the 9 th of March and will begin at 11am from St Columb’s Park, this race has an entry fee of £8. 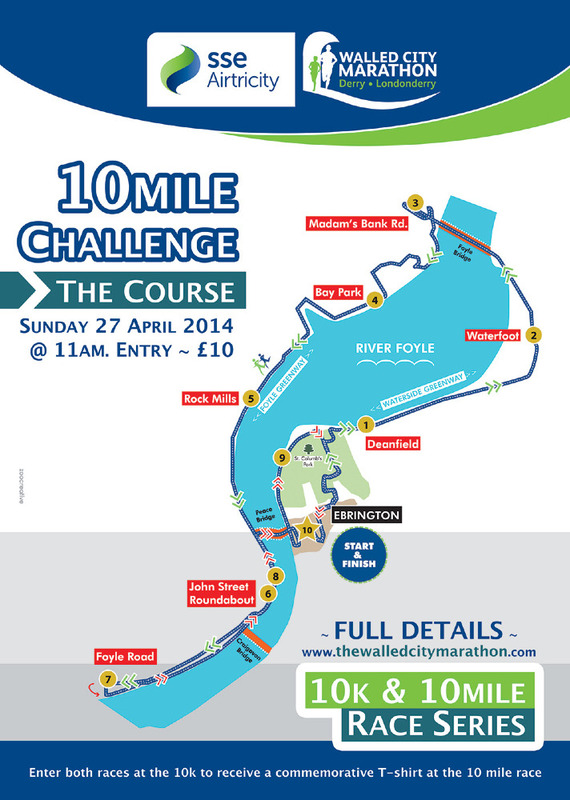 The 10 Mile Challenge will take place on Sunday the 11th of April and will begin at 11am from Deanfield, this race has an entry fee of £10. Entrants for each race will receive a commemorative t-shirt. For information on Dates, Times, Fees, and Routes please click on the images below. If you are travelling to Derry for any of the above events do not hesitate to contact Derry Self Catering apartments for information on the events or to make a booking for accommodation.